SFA Gardens will host the third annual Nacogdoches Seed Swap at 1 p.m. Saturday, Jan. 20, at the Brundrett Conservation Education Building at the Pineywoods Native Plant Center. The event is free and open to the public. NACOGDOCHES, Texas - As seed catalog season quickly approaches, SFA Gardens invites fellow gardeners to join in the third annual Nacogdoches Seed Swap beginning at 1 p.m. Saturday, Jan. 20, at the Brundrett Conservation Education Building at the Pineywoods Native Plant Center. All viable flower, herb, vegetable and tree seeds may be swapped, whether they were purchased at a nursery or saved from your own garden. "Seed swaps are the perfect opportunity to build community relationships by connecting through growing food and sharing our abundant resources," said Kerry Lemon, head of the Thomas J. Rusk School Garden and former assistant education coordinator at SFA Gardens. Participants should bring their seeds labeled with the variety and year collected or bought. Seeds do not need to be individually packaged. They can be brought in their existing packets or containers. Envelopes will be provided for attendees to take home swapped seeds. Volunteers will help attendees display their seeds on appropriate tables - vegetable, herb, flower, tree, mystery, etc. After all the seeds are organized, swapping begins. There is no limit to the number of seeds participants may take home, but generally, participants should bring home about as many seeds as they brought. Newcomers also are welcome to attend to begin to build their "inventory" of seeds and meet new friends. 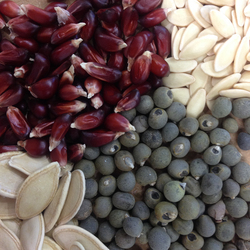 "Previous seed swaps drew many gardeners who were eager to share their saved seeds, best tips and garden tales," said Jocelyn Moore, assistant education coordinator at SFA Gardens. "Some seeds from past swaps were saved through many years, including the Longhorn Okra, saved for more than 15 consecutive years." The event is free and open to the public. Donations are gladly accepted and support Nacogdoches Naturally, the SFA Gardens afterschool gardening club. For more information, contact Moore at moorejv@sfasu.edu.